As much an eccentric character study as a road movie, Michael Cimino’s directorial debut follows the adventures of a quartet of misfits in their life of crime. 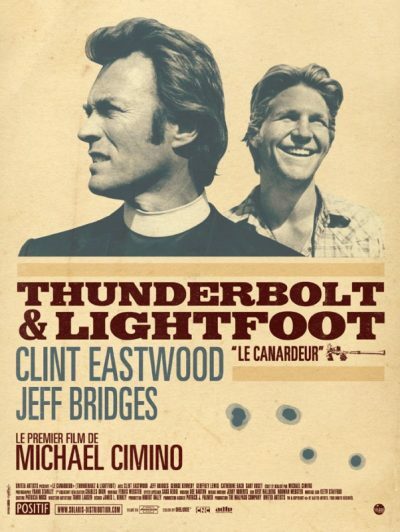 Retired thief Thunderbolt (Clint Eastwood) and sweet drifter Lightfoot (Jeff Bridges) meet cute when Thunderbolt jumps into Lightfoot’s stolen car to escape a gunman. The pair embarks on an oddball journey to get Thunderbolt’s loot from an old robbery before his former associates, the sadistic Red (George Kennedy) and cretinous Goody (Geoffrey Lewis), get to it first, but all four are too late; the one-room schoolhouse hiding place has apparently vanished. So instead, the four play house and work legit jobs while they plot to rob the same place Thunderbolt and Red hit before. Although the plan goes awry, Thunderbolt and Lightfoot discover that they may still have succeeded-or so they think. As the easy-going mediator between the two, Eastwood’s Thunderbolt was a move away from his tough cop-westerner image; his audience accepted this then-atypical performance enough to turn Thunderbolt and Lightfoot into a moderate hit. Bridges received his second Best Supporting Actor Oscar nomination, but Cimino turned down a subsequent deal with Eastwood, moving instead to his artistic peak with The Deer Hunter (1978) and career nadir with Heaven’s Gate (1980).